Jennifer, Melissa, Jessica, and Amy — these were the most popular girls names the year that I was born. My parents had a short list that included Heather, Holly, Fern, and Laurel, but on a Tuesday in September, 1978, Hilary was inked onto my birth certificate. Hilary, with one L.
My name is Hilary, with one L. Not Hillary, Hilarie, Hiliary, or Hillery. My name is definitely not Hil or Hils. Please don’t call me that; I will politely, but firmly, correct you. “But, I just can’t help it,” someone once told me when I asked them, for the umpteenth time, not to call me Hil. Why was it so hard for a grown woman to call me by my name? Shouldn’t a one time request to do so be sufficient? It took my calling her a clunky shortened version of her name to resume being called Hilary. A friend of a friend texted me the other day with a question about natural hair. The salutation read, “Hey Hils!” and immediately, my face twisted up. Hil. Hils. It’s nails a chalkboard to me. It’s someone biting their fork when the eat. It’s a close talker, a mouth breather, a persistent arm-toucher. It tells me that you don’t know me because if you did, you would know not to call me that. My memory is not that great. I can walk into a room and stop mid-stride because I’ve forgotten why I walked in there in the first place. I don’t have a knack for dates, historical or otherwise, or how old my girls were when they started walking (I wrote it down so I wouldn’t have to remember), but I can remember names. At the grand opening of the St. James in September, I was introduced to more people than I could count, many of whom are part of the STJ team. Despite the weeks in between our visits to the complex, when I go, I greet as many team members by name as I can. Remembering someone’s name lets them know that they are valued and respected. Have you ever considered how a name connotes the type of relationship you have with someone? I know a woman who who goes by a peculiar nickname — let’s call her Twitch. Before I met her, our mutual friends always referred to as Twitch. When we finally met, she introduced herself to me as Elaine. Twitch is a name to be used by close family and friends. Until she invites me to call her otherwise, she’ll always be Elaine to me. When my husband and I were picking names for our children, we wanted to give them strong, unique names — ones that couldn’t be lopped off into awkward tag. The family names I loved best from our family tree started to become more popular. I didn’t want our daughter to be Eleanor D. or Hannah D. or Grace D. Her name had to stand on it’s own, just like she would. Our first daughter, M, has been the first and only of her name throughout her school experience, as has our second daughter, C.
C goes by her middle name, the maiden name of my husband’s grandmother. It’s distinctive. It suits her. It is begs to be misspelled and mispronounced -the emPHas-IS is always on the wrong SYL-lab-Le. She’s never going to find it on a mug or a pencil or a keychain. If she one day decides, “Enough’s enough. I’m using my first name,” she can. Of course, her first name is can be spelled a myriad of ways so, ¯\_(ツ)_/¯. Our third daughter, V, is the first and only in her class, but not in her grade and not in the school. Hers is a name that is old enough to have ebbed and flowed in popularity such that there haven’t been a huge flock of them the way there were Stacys, Tracys, and Andreas when I was growing up or even the Lily’s, Hannahs, and Grace’s of today. Like her sister, however, her name begs to be misspelled. V being V, though, she’s quick to correct you and keep it moving. 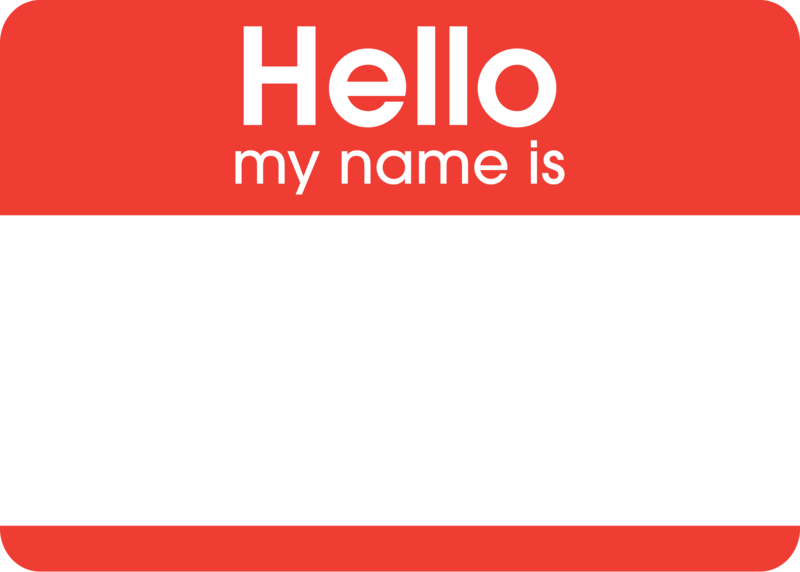 In Caitlin Macy’s essay “What’s in a Name”, the author explores how she came to love and appreciate her hard to pronounce name. Macy reveals that when she had children of her own, she was determined to select easy to pronounce, impossible to misunderstand monikers for them. Upon hearing that Macy named her daughter Violet, a neighbor jokingly hopes the child doesn’t grow up to be a “shrinking violet”. Until that moment, it never occurred to me how a name gets away from a parent once it is in the world. All these years later, I can still feel the name float out of my mouth like a speech bubble. I can see my friend’s widening eyes as she made the connection between the name I’d uttered and my pregnant belly. I can hear my inner voice sighing. I put her name out there before I was ready to share it. I had exposed it to scrutiny and judgement. When you give something a name, it becomes real in a way that it hasn’t before. And despite the realness of that little one’s kicks and punches pressing against my abdomen, giving her a name unspooled her story before I was ready. In the end, it all worked out. C got the name that was meant for her just as there’s a Harper Grace out there who is perfectly suited to her name. Names indicate belonging, relationships, and identity. 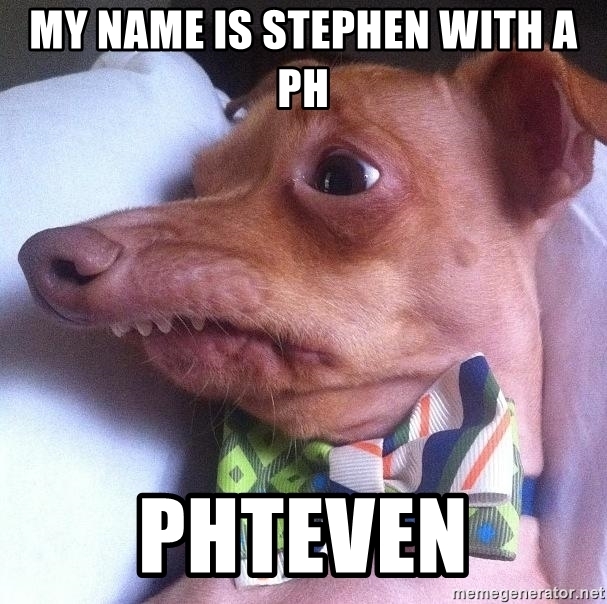 Names are personal. 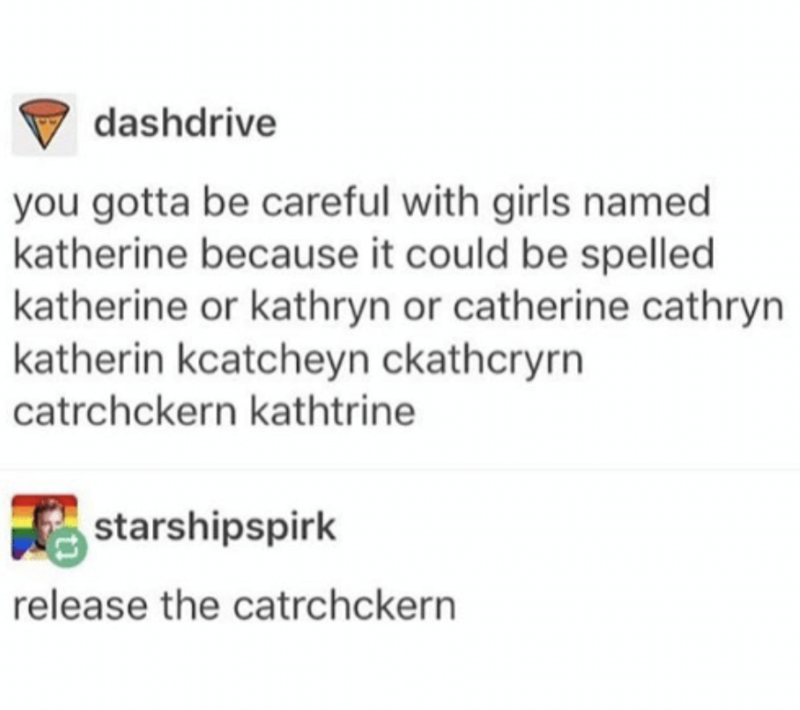 Names are power. My name is Hilary, with one L.
Is there a story behind your name? Tell me about it in the comments! I don’t even know if I remember how to do this. It’s been months since I’ve written anything. More specifically, it’s been 5 months and 12 days. Not that I’m counting, of course. 5 months and 12 days. When I’ve made the time to write, I haven’t had anything to say. When I get an idea, it’s usually when I’m in the middle of something else — pumping gas, folding laundry, in the shower. Attempting to abandon whatever I’m doing to grab a pen and scribble it down is like trying to carry gallon of water in my hands to a cup across the floor. Whatever thought I’ve had is up in the ether before I can disentangle myself from a freshly laundered fitted sheet. I’m a writer that doesn’t write. I don’t know if I want to display myself any more. I don’t know if I want to share everything that’s been going on. Exhibit my triumphs and my failures. My momma said these are my thoughts and feelings and I don’t have to share. And yet, even as I write this, I know I’m gonna share it. 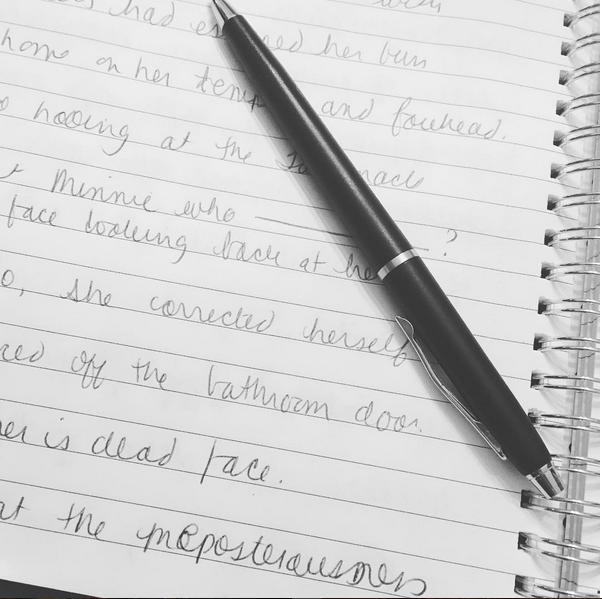 Why am I not writing? Nothing’s happening. Everything sounds the same. Trite, boring, unremarkable. I’ve lost what makes me special. Did I ever even have it? Ugh, don’t do that! Don’t be a. . .don’t be a . . . What’s the word? What’s the word? Why don’t I have the words? I don’t have the words. They are loose change that dribbled out of the hole in my pocket when I walked down the street. They are the the chapstick you leave in your best friends car. They are the Starbucks sitting on the roof of your car as you wheel out of the Target parking lot. I drink coffee and it makes my brain itch. I don’t think my neurons are on speaking terms. Or maybe they’re speaking a foreign language? Mother tongue that I’ve forgotten? Oú est la biblioteque? I need to disabuse myself of the idea that I will write the combination of words and sentences and paragraphs so compelling, it your hurts chest not to read it again and again. Something like that requires actually having something to say. My fingers are poised over the homerow keys, ten sprinters at the ready in the blocks. They’re waiting for the crack of the gun. Let me see what’s happening on Facebook real quick. I’m slowly disconnecting from social media. I’m posting less. I’m commenting less. I’m checking with less and less frequency. Quiet as it’s kept, I’m unfriending names from my newsfeed and ghosting from groups. It feels like the part of the novel where affairs are being put in order before a great change. Maybe I just need to cut my hair. Instead of jumping into the deep end of the pool, I pivot and dive into the corridors of Pinterest. I work on my office, curate the space to uncork whatever is preventing the creativity from pouring out. I rearrange the shelves and organize my books according to genre, then color, then size. I pick out storage boxes that make me smile to look upon them. I go a little crazy on Etsy picking out prints for the walls. I am creating in a different way, but I don’t have the words to tell you about it. All I can say is that it looks like Kate Spade threw up in here. Sometimes I want to lift my brain out of my skull and give it a good shake, Magic 8-Ball style. Reply hazy, try again later. The good ideas are in there, I know it. I just can’t see them for all the clutter of pop culture references, random bits of info, and factoids I was assured would be used daily as an adult (looking at you CPCTC). When my Headspace App tells me to breathe deeply and release my mind for a moment, I imagine my brain detaching from its tether and just floating peacefully on the current cerebral fluid its nestled in. I can almost physically feel a detachment, like tiny belch of release. Sweet relief. The laptop is slowly roasting the tops of my thighs. The phone is in my hand, my thumb scrolling, scrolling, scrolling. I think I’m getting more dumber-er. I read books — self-help books whose margins I destroy with armies of exclamation points and arrows, novels whose prose I bite off the page and hold in my mouth to savor, essays and short stories that leave me both destroyed and renewed. In my desk are pages of ideas. There notebooks with plot summaries, character profiles, and a thousand different ways to say “nice”. What would happen if I just shred it all? What would happen if I just open to a clean page and picked up my pen? I’ve got a flop sweat going on and my armpits are tingling. What would happen if I just picked up my pen? This summer has been a finger snap. We’ll no doubt be heading into the final third of the summer like we’re being chased by responsibilities and realities of the fall — full throttle, trying to get in as much of everything and nothing as the daylight hours allow. The girls have been at camp for the past two and half weeks, which has left me on my own to alternately do nothing and everything. This is their fourth summer away and the fourth summer where I have planned to make the best use of my time. M asked me what I was going to do while they were gone. “Nothing,” I replied. That was my plan; do nothing. I spend so much of my time ripping and running, crossing items off of lists, and cross checking iCal with my planner, it’s nice to have no plan at all. A quote attributed to John Lennon says, “Time you enjoy wasting, was not wasted”. I’ve thought about this quite a bit since the girls have been gone. In the quite hours of the evening, when I would usually be steering the girls toward their bedtime routine, I’d wonder if I’d made the best use of my time that day. Should I have organized the linen closet? Could I have cleaned out the myriad of crumbs and wrappers from the corners of the backseat? I probably could have done the back to school shopping, at least. As these thoughts bloom in my brain, the mom guilt comes tip-toeing in close behind. You had an opportunity to do, do, do! How could you not have done this, that, and this? Instead of reading that last chapter/watching that last episode/taking that clinic, you could have done that, this, and that! Thankfully, I’ve learned to smack that noise down before it takes root. who knew guilt wore sweater vests? Yes, I could have done those things. I could have done more. I am used to doing THE MOST. However, I’m fed up with the girls coming home from camp and feeling as though I spent so much time on everything else, I’m on empty before they’ve even gotten their trunks into the car. So, how do I put a cork in the guilt and re-charge myself to be fully present when the girls come home? 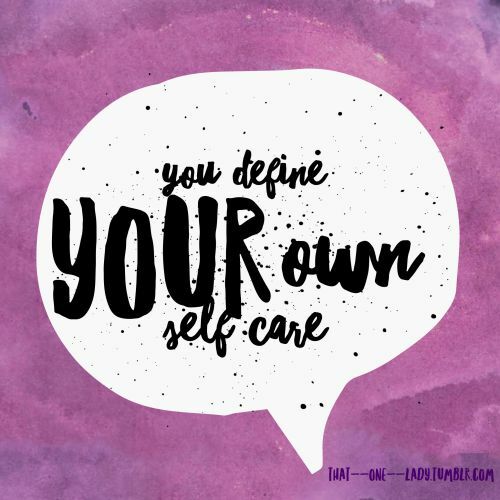 Self-care is a topic that is batted around quick a bit these days, but not always easily defined. Self-care can seem like squishy, maybe even selfish concept. I’ve read articles and seen blurbs from self-help books that point to everything from “Treat Yo’self” type of experience to an introduction to mindfulness to hugging a puppy. The one thing that all of those articles and books have in common is that self-care is vitally important to your routine and that above all else, it is deliberate and self-initiated. No one can do it for you. I will admit, this is all very new to me. 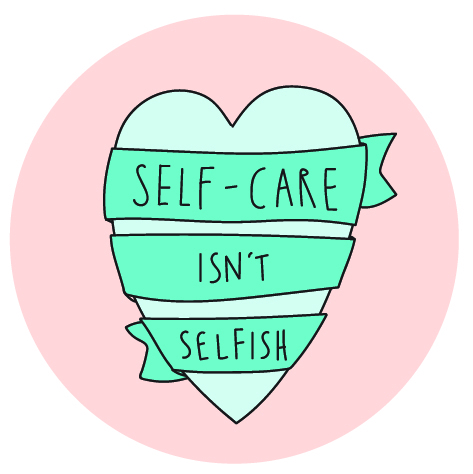 I’m an eager, over-achiever as we all know, so I take comfort in the fact that self care is a practice. There’s no reason rush, no finish line to cross, just small steps to take towards feeling fulfilled and happy. And as we all know, if mama ain’t happy, ain’t nobody happy. . .
What do you do to practice self-care? Several months ago, a friend of mine sent me an email about a very intriguing project she was undertaking. An avid reader and postcard collector, Anita was about to launch a website that not only promoted books, but provided the visitors with a glimpse at another side of published authors. Authors sent Anita a postcard of their choosing and included a brief note about whatever they felt would allow people to see a bit of their personality. Anita then published the postcard. Every submission was accompanied by a short blurb about the author including their recent or upcoming work and where to find it. Suffice it to say, there has been much clicking of links to personal websites, IG feeds, and Amazon to fill my wishlist with the titles of these talented authors. As someone who appreciates the written word and visual imagery equally, this website is a real treat. 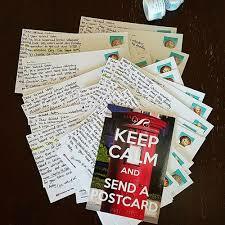 The postcards are just as fascinating as the person who jots down notes on the other side. Landscapes, photographs, and print reproductions dot the website. It’s easy to see that each postcard has been as carefully selected as the words on the reverse. The handwriting on each card, whether it’s looping curlicues of script or short quick strokes of printed letters, tell a story in and of themselves. Each author pulls the curtain back just a bit, revealing a sliver of themselves in the words they choose and the ink that colors the page. Since its debut in December of 2017, 10 authors and their postcards have been featured ranging from children’s literature, fiction, and non-fiction. When you have a minute, take a peek at Postcards and Authors. In the words of author Jamie Ford, whose postcard of The Crim Dell at the College of William and Mary had me waxing nostalgic for my undergraduate days, “Actual paper with actual ink! Yay for human connectivity.” Yay, indeed. Last Saturday, I was having an all out crank-out. I was out of sorts, tired, and just feeling “meh” about everything. Talk about waking up on the wrong side of the bed. I woke up on the wrong side of the house, the street, and the neighborhood. The level of crankiness I achieved had not been seen in our house since the girls were in diapers. There was no rhyme or reason to it. I was just cranky. Thankfully, I have an amazing husband, who, rather than gather up the children and flee to higher ground (i.e. anywhere outside of my vicinity), drew me in close as if to tell me a secret and whispered in my ear his plans for us to have an impromptu date night later on that evening. His recognition of my distress, his playfulness, and his solution, were so timely (and so appreciated), I couldn’t help but loosen my grip on the bad mood and watch it float up, up, and away. He’s good like that. Handsome, smart, ambitious, and can talk me down off the ledge with the promise of fajitas and margaritas? He’s definitely a keeper. This particular day, he outdid himself. Same day, later on in the afternoon, we were relaxing in the living room while the girls played on their own. I had to run an errand in a little while, and I asked the Hubs to remind the girls to take care of their chores while I was gone. I asked him to do it because (IMHO) they’re more likely to listen to him than they are to me. I said as much and then started to unspool a story to back it up. The Hubs came over to where I was sitting and all but put his finger to my lips to hush me up. I was so caught off guard, so instantly deflated, I couldn’t do anything but laugh. “The express train to Negative Town? !” And then I realized, I was literally standing on the platform, waving my ticket in the air. I was about to jump onto that train and ride it all the way into the city center, where no doubt I’d spend an inordinate amount of time belly-aching and stewing. And for what reason? There’s no feeling better on that ride. There’s just picking up every slight and snub until your pockets full and you can barely shuffle along. With one unexpected and timely suggestion, the Hubs effectively pulled me away from the tracks and tore up my ticket. I’ve never considered myself a damsel in distress, but I certainly got rescued that day. Since then, whenever I’m starting to feel the desire to air my grievances, I think about the express train to Negative Town. Almost immediately, whatever I was about to carry on about seems ridiculously unimportant. The express train to Negative Town? Why? There are so many better places to go and I’ve got the best guy to go with me. I’m not going to lie; parenting is a tough business. I’m constantly wondering if I said the right thing at the right time or if there are enough fruits or veggies in their lunches. I worry that they’ll never ever learn to do their own laundry if I keep doing it and that if I refuse to clean it, they’ll let dried toothpaste build up in the sink like a carapace. I worry that the only time they aren’t fussing with one another is when they’re sitting, glassy-eyed in front of the TV. Oh, the fussing! The bickering! The crying — them, not me. And it’s over mundane, trivial things like, who finished the last swallow of apple juice, who gets to sit in the front seat, and whose turn it is to change the toilet paper roll. Honestly, I think they would let themselves air dry rather than take the initiative to replace the roll. It feels like there’s always some squabble going on. Each time, I’ve tried a different way to squash it before it gets to DEFCON 1. I’ve talked about walking away when someone starts to get on your nerves. I’ve used the get-a-long shirt. I’ve had them hug-it-out. I’ve had them hold hands while they tell each other what they love about one another. I’ve had them use I-messages. An I-message is statement to express a problem without assigning blame. It’s called an I-message because they start with “I feel [felt]” and makes it about the speaker, rather than about someone else. This approach has hits and misses, primarily because when one of the girls uses an I-message, the recipient fires back with an I-message of her own about the first I-message. Then we’re back to where we started. To combat that, I’ve been having the girls write out their I-messages and exchange them. They can’t reply to what they’ve received and some sort of detente is reached. It’s a work in progress, as is the work I do with V after school. We’re practicing ABCs and 123s, we’re working on shape identification, and letter sounds. I’m reinforcing concepts that she’s getting at school and she gets to feel like she’s a big girl doing homework just like her sisters. The other day, she will made a worksheet of her own and asked me to complete it. Since we’re still working on penmanship and math facts, her numbers were backwards and her most of her sums were incorrect. Still, she demanded really wanted me to do the sheet with her. I suggested we copy it over together. I started to re-copy it, adding little triangles, stars, and hearts to give her visual representation for each group of numbers. She angrily pushed her pencil across the table. I began to cajole her into at least trying to mimic what she saw, explaining why we’re doing this. She reached deep into her guts, and blew out a “No!” so deep, so throaty, so completely and utterly fed up and frustrated, it left my feelings checking themselves for injuries. With fingersnap quickness, I said, “Alright, we’re done. You cool out in your room until dinner.” I gathered up the papers, the pencils, the workbook. I put them away. She started sinking further and further down in her chair, kicking her heels against the legs before hurling herself away from the table to stomp up the stairs as heavily as her size 12 feet could manage. 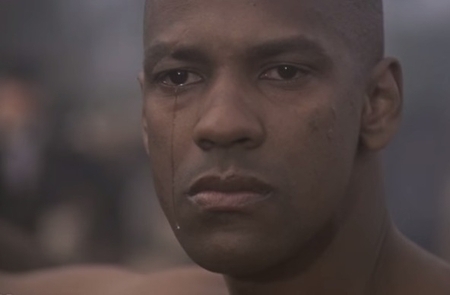 She’s on the left with the downturned mouth and single, Denzel tear. I’m on the right looking like Jaws (the shark or the baddie from the Bond films, take your pick). Apparently, when I’m mean, my hair goes straight. 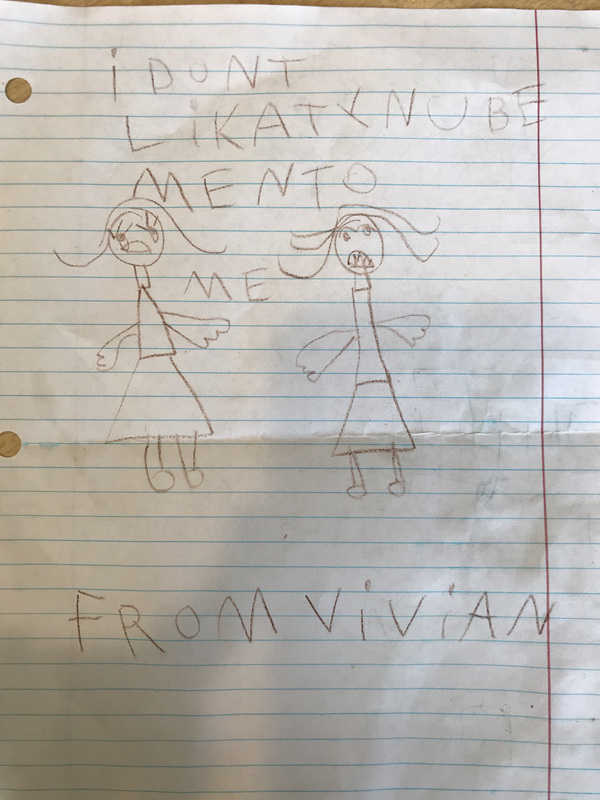 While I really wanted to roll my eyes at this, I have to give it to V. At five years of age, she got a grip on the tantrum that was threatening to blow the beads off her hair and instead, chose to send me an I-message, complete with visual aid. That’s a skill some adults can’t even master. Parenting is a tough business, but every now and then, there are these gold star moments that remind you that you’re doing just fine. For real, I have to get this off my chest. 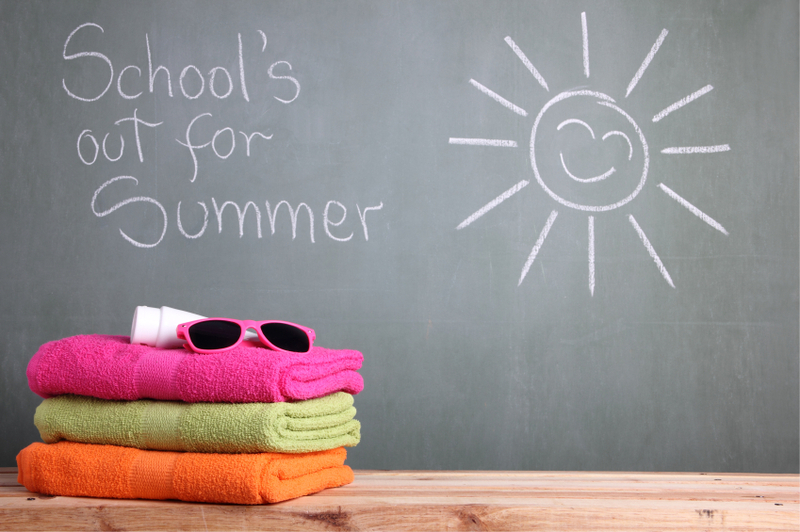 I don’t like summer break. I’m hoping that me and the three love-bugs will spend many days outside just watching the clouds roll by and waiting for the delicious melody of the ice cream man rolling through the neighborhood. There will be sidewalk chalk. There will be bubble juice and every conceivable contraption to make bubbles. There will be sprinklers and new bathing suits. There will be trips to the pool. There will be trips to the playground. There will be Popsicle stained mouths and dirt stained knees. There will be bug bites and lightning bugs trapped in jelly jars. There will be cook-outs with ketchup stained paper plates. There will trips to the Vineyard, to the grands. There will be smiles and laughs and happiness. Let’s get started. . . I thought that if I could conjure up the good time in advance, there was nothing preventing it from happening. And summer was fun. We did all of the things and then some. Trust and believe however, when the back to school alerts started springing up, no one was more excited than me. As a kid, I wanted nothing more than week after week of freedom while the sun rose early and set late. As a parent, however, seeing the sun streak across the sky at 5:54am and finally decide to rest up by 8:37pm has me wringing in my hands over what I’m going to do to fill the hours in between. I have the best mom friends, no question, but when I see posts on FB from them talking about “Whoo hoo! School is out” and “No more packing lunches!” and “Nothing by relaxing by the pool!” I wonder, who are these women? They want a planned itinerary. I want them to enjoy their summer vacation like I did. I was outside. Screen time (TV) was limited. I was at the pool, floundering around trying to pass a swim test to graduate to the deep end where my friends were. I did the book challenge at the library. We went to an amusement park. As I got older, there was some summer school in there, a two-week sleep-away camp, stuff like that. I don’t think my mom had the subtle undercurrent of anxiety that I do when I look at the calendar and see 12 weeks unfurling in front of me. I caught myself trying to be slick and scheduling some camps for the kids every other week, not only to keep them active, but to keep me sane. On the off weeks, I’ve felt like the cruise director from the Love Boat (look it up), clipboard at the hip, ticking off the activities scheduled between feedings. There will be bubbles and hula hoops on the porch from 9 to 9:20, snack on the grass from 9:25 to 10:10, playing in the sprinkler from 10:15 to 10:21, snacks on the Lido deck at 10:30. . .you get the idea. To “No more packing lunches!”, I say, “I wasn’t aware that was something a person could do.” I’m being cheeky, of course, but while some of the school routine goes away between June and August, making lunches isn’t one of them. Occasionally, I’ll treat the girls to lunch out, but more often than not, I’m that mom with the packed lunch at the pool, the Ziploc bag of microwave popcorn and leftover Halloween candy at the movies, and the Scout bag of snacks and juice boxes in the back of the car at the playground. They hate that, kind of like I hated it when my mom whipped out her bag o’ homemade snacks from her purse. Ahh, the circle of life. From the moment their little eyes open until I am herding them upstairs for the bedtime routine, my girls are constantly asking what there is to eat or when they can eat next. When I’ve had them make their lunches on their own, the results have been laughable. One packed chips, crackers, cookies, and a slice (one slice!) of ham. The other packed two squeezable applesauce pouches, two bags of chips, crackers, spreadable cheese, a slice of bread, cookies, and small container of ranch dressing (???). 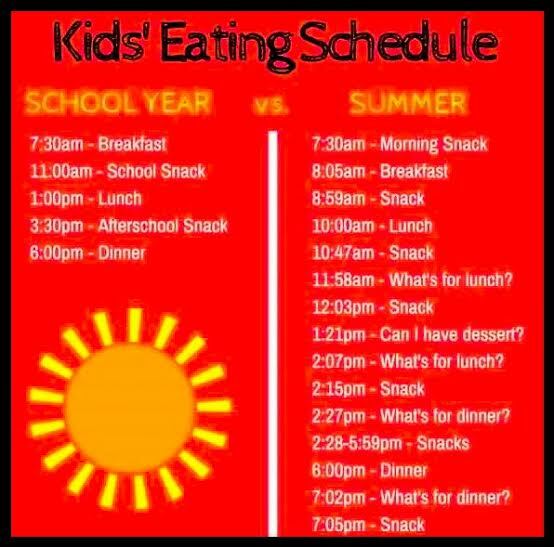 I know, they’re not going to die eating like that, but working towards raising healthy, savvy adults means resting a guiding hand on their shoulder when they start listing too far off course. To “Nothing but relaxing by the pool!”, I think, “They must have grown kids who can swim because pool and relax only happen when I go to the pool by.my.self. Granted, I do have a small person who just turned five and who, despite her protestations to the contrary, is not a mermaid. So I’m in the water — or at least sitting with my feet submerged close enough to hop in if she’s in distress. And of course she wants to be with the big girls who want to be anywhere she’s not, which means mediating the sisterly struggle at home, on the way to, and while hanging out at the pool. I know that this time will be short-lived. Soon very soon, all three girls will be gliding through the water without floaties, being the sirens they claim themselves to be. I’m exaggerating, a little bit, but I do wonder what’s wrong with me that I’m not clicking my heels at the prospect of “no more pencils, no more books, no more teachers dirty looks”. My armpits get sweaty just thinking about it. How do I fill up the time? How do I make the summer fun for the girls without losing my mind? How do I keep the girls entertained while trying to get the mundane stuff done? How do I keep the girls from climbing the walls when it rains or when I don’t have an activity planned? These are legit questions pinging around my brain the other day, master calendar spread across the table and September 1st an oasis on a distant horizon. Then this article popped into my inbox. What will leave the greatest impression on my kids as they grow? The fact that every day of their summer was chock-block of things to do from sun-up to sun-down because if they aren’t being constantly entertained, did their summer even really happen? How about a mother who was smiling and engaging and laughing and playing because she put herself first. That means, trying to make everyone else happy, she made herself happy. As we all know, if mama ain’t happy, ain’t nobody happy. Trust and believe this doesn’t mean I’m going to be living my best life while the girls are left to fend for themselves. It just means, if it makes me happy to not do something or to do something else, I’m going to do it. I have to get of my own way, too. TV in the middle of the day isn’t going to turn their brains into mush. I have made my kids’ happiness the most important thing. Instead of dialing it back from the marathon of the school year, I have been tacking on another 13 miles and trying to run it with my best time ever. 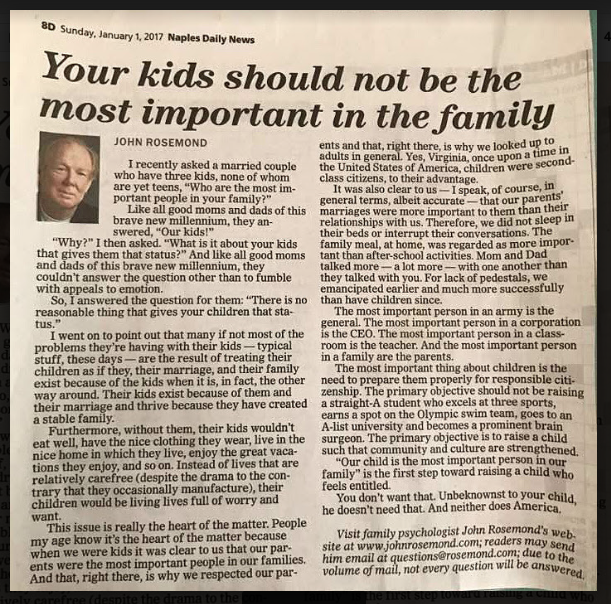 Don’t get me wrong, I want my kids to be happy, but I don’t have to kill myself to do it. I have unconsciously self-imposed these far-flung standards of what we have to be doing to ensure we’ve had our best summer, every summer. That’s unsustainable. It’s swathing my kids in a sticky sense of entitlement that I loathe. As a result, I’ve blamed it all on summer break. I’m willing to do the work to change my perception of what summer has to be. I’m going to do things that make me happy which in turn will benefit the girls in the long run And while come mid August, I may be surreptitiously packing their school supplies in between trips to the pool and shoving snacks in their faces, at least I can say I will have given it a try. Tell me about your plans in the comments. Maggie Sinclair, Will You Please Fix Your Hair?! Get your copy of Hilary Grant Dixon's phenomenal children's book, today! © 2015 Hilary Grant Dixon.